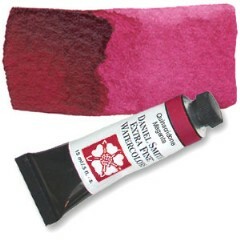 This deep red violet disperses evenly with slight granulation and moves from deep darks to clear, glowing washes.Like all Quinacridones, it is an extremely lightfast organic pigment. In terms of complementary couples, Quinacridone Magenta works especially well with yellow greens. Highly durable and extremely transparent, all the Quinacridone colours excel in vivid clarity and intensity.